HMP Oakwood, a 1605 bed male Category C (medium secure) prison in the West Midlands in the UK, was opened in April 2012 under the management of the private security firm G4S. Prison Dialogue partnered with G4S in the bid for HMP Oakwood, proposing that they would support a cascaded approach to create and embed a vision for the prison from the Director through all of the management ranks, to staff and prisoners. 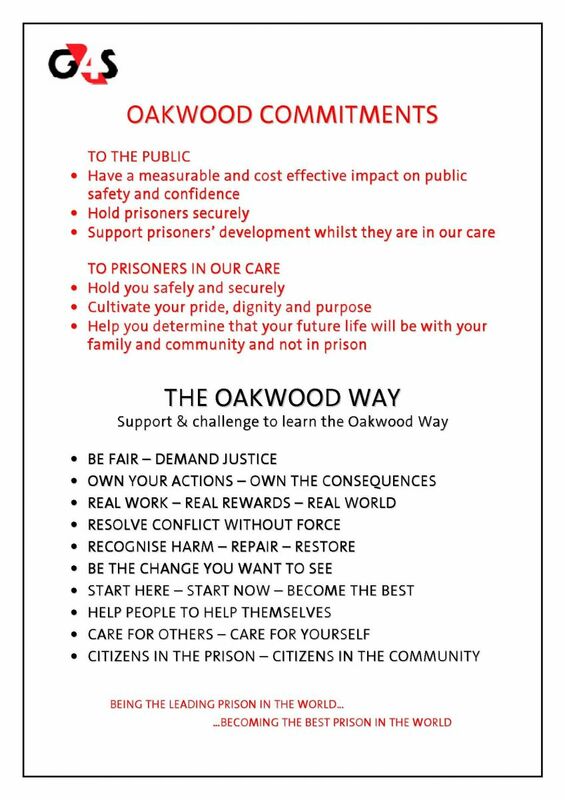 The aim was for everyone who lived, worked and visited Oakwood to work together to achieve the common goal of a safe, productive and effective rehabilitative prison for the future. Prison Dialogue had run staff/prisoner Dialogues in prisons at all security levels since 1993, when the first Dialogue was started in HMP Whitemoor a high and maximum security prison in the UK. The Dialogue skills for engagement, communication and change used by Prison Dialogue had evolved significantly since those early Dialogues, including the development of processes, structures and training for staff learn to facilitate Threshold Dialogue and wing based staff/prisoner Dialogues.